Welcome to another week of my 52 Projects/52 Weeks Challenge….visit my 52/52 Challenge Gallery (above) to see what I’ve done and check out my Notebook on Springpad to see my ‘to do’ projects. 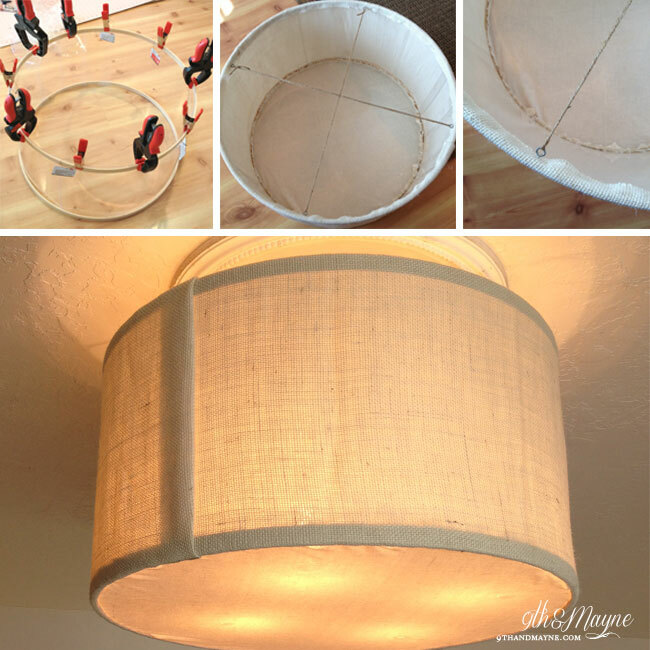 So happy to share this DIY Drum Shade project with you! I had a great time making it and an even greater time watching My Man put it up….over the ceiling fan base! Yep, over the ceiling fan! 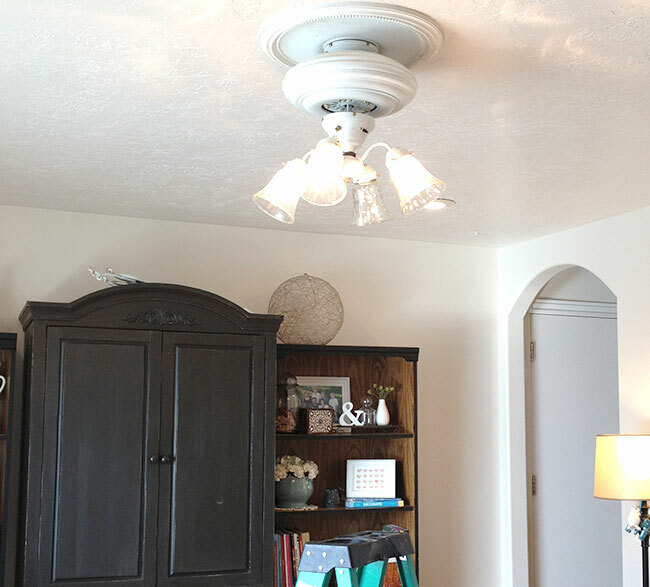 I’ve had a love/hate relationship with our ceiling fans so I HAD to find some way to hang a nice light fixture without taking the whole thing down, just in case we need the fan this summer. So, taking great advice from my mom, we took the blades off and stuck the shade right over the base…piece of cake! Thanks, Mom! I got the idea for the shade from The Keylor Family blog. Her tutorial is awesome! I always forget to take pics…grrr. I love how hers turned out! I changed a couple things on mine but it looks mostly the same. I told you I forgot most of the pictures. I get so excited and totally forget! I’m trying to remember tho. If you go to The Keylor Family blog, you’ll see that she put the plexiglass in between the hoops, so smart!..but I decided I didn’t want the bulky bolts and wood blocks showing so I used the inside of the hoops and glued the plexiglass to the hoops using E6000 glue and clamps. It took an hour or so for each side to dry and then it was ready to be covered. I used burlap lined with muslin because I didn’t want the shade to be see thru. It was easy to glue the fabric on until I got to the bottom opening. It was harder than I expected. As you can see it’s not perfect but who’s going for perfect anyway!? ha! I know I don’t have lots of pics, next project!…but if you want a great tutorial…go see The Keylor Family blog, she did a great job with lots of pictures. Pottery Barn couch – We have one but our room really needs two…and we have 9 peeps in our family so we need more seating. Fabric for curtains….haven’t decided on a specific one yet. I’m linking up with Make the Scene Monday, Made by You Mondays, Get Your Craft On, Monday Funday, Creative Spark, What We Accomplished Wednesdays, Think Tank, Transformation Thursday & Inspiration Gallery & Fabulously Creative Friday & Chic on a Shoestring Decorating. So many great projects on these sites, check’em out! Very clever disguise Kristin! 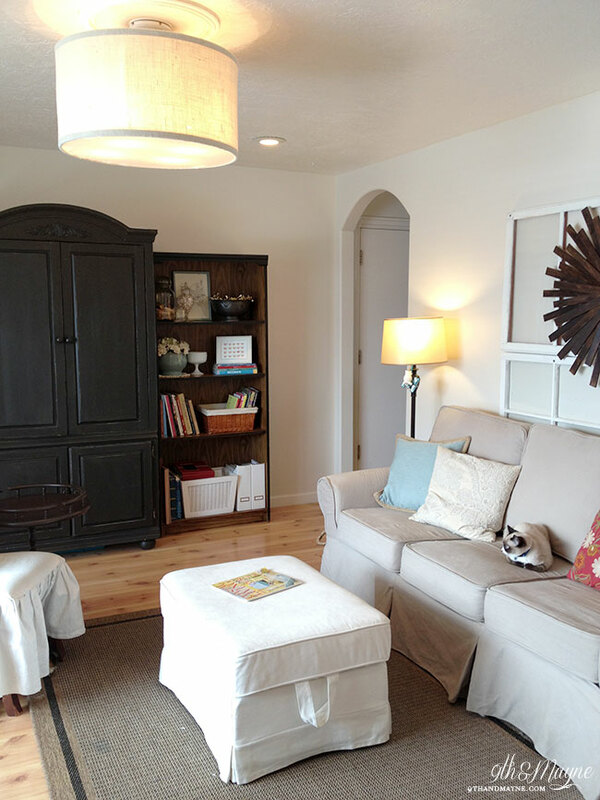 We have ceiling fans too, but we really need them during the summer. We have no air conditioning, and usually don’t need it, but for those especially hot summers or even a few weeks of hot, they are our salvation! We really need our fans also but I really wanted a drum shade. 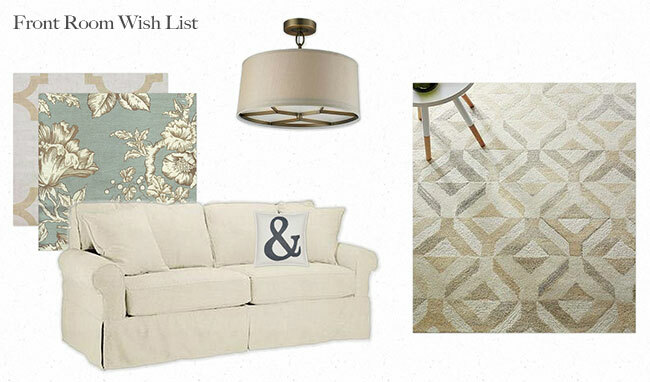 :) The things we do for styling our home. We have A/C so the fans are an added bonus but not a good enough bonus to pass up pretty lighting. Thanks for stopping by!